You are here: Home » MEDIA » Films » Captain Marvel (full trailer #1). Captain Marvel (full trailer #1). Here’s the first full trailer for the 2019 Captain Marvel movie, where Carol Danvers becomes one of the galaxy’s most powerful superheroes after Earth is caught in the centre of a galactic shoot-out between two deadly alien species. But is Carol really human or just an alien brainwashed into thinking she is one of us? 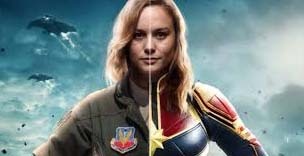 Captain Marvel (TV spot trailer). Captain Marvel: last pre-launch trailer. « The Dragon’s Child by Janine Webb (book review).